"How do you deal with this? You're never going to be able to un-see what you saw." Uh oh. Briarcliff Ent. 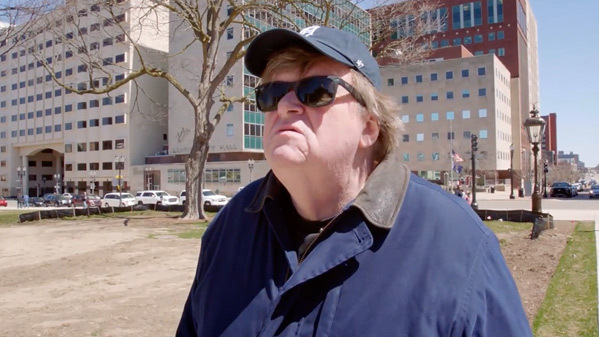 has unveiled the first trailer for the new documentary by Michael Moore, titled simply Fahrenheit 11/9, a spin on the title of his Oscar-winning documentary Fahrenheit 9/11 released in 2004. This time Moore digs deep into the American culture to ask two provocative questions about the "Trump era": How the f**k did we get here, and how the f**k do we get out? I'm honestly very curious to see how Moore tackles this, as he has been very vocal on Twitter the last few years, talking about how crazy everything has become. The film will premiere at the Toronto Film Festival first, then they've already set a late September release date in theaters nationwide for everyone to see this and get riled up. Not much is shown in the trailer, but get ready. Michael Moore's Fahrenheit 11/9 is a provocative and comedic look at the times in which we live. It will explore the two most important questions of the Trump Era: How the f**k did we get here, and how the f**k do we get out? It's the film to see before it's too late. Fahrenheit 11/9 is directed by one-of-a-kind American filmmaker Michael Moore (follow him @MMFlint), director of the documentaries Roger & Me, The Big One, Bowling for Columbine, Fahrenheit 9/11, Sicko, Slacker Uprising, Capitalism: A Love Story, and Where to Invade Next previously. The film will premiere at the Toronto Film Festival this fall before hitting cinemas. Briarcliff Entertainment will then release Moore's Fahrenheit 11/9 in theaters everywhere starting on September 21st coming up soon this fall. First impression? Who's interested in watching this?